It was a freezing cold Wednesday night but for some reason I was seriously craving an ice cream sundae. Where to get a sundae that won’t completely chill my bones but satisfy my needs? Chikalicious Dessert Club of course. I love Chikalicious. The main Dessert Bar is great for a luxurious dessert experience, but when you need your sweet fix quick, the shop across the street is the way to go. They have everything- caramel and smores cupcakes, green tea grand mariner cake, chocolate eclairs, vanilla custard and most importantly for me sundaes. I decided to order the Espresso Ice Sundae. First off, Chiklicious vanilla soft serve is awesome. I don’t know what they do but it’s really natural tasting and not super sweet. It’s possibly the best soft serve in the city. Then they top that with pearls of chocolate and a shot of decaf espresso. This is the perfect sundae to get on a chilly winter night. The espresso warms up your tummy while the ice cream and pearls satisfy the sweet tooth. Mr. T ordered the other sundae they offered the Hot Fudge Vanilla Bean. 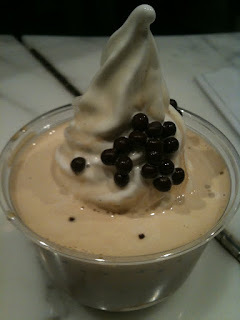 They use the same soft serve and chocolate pearls as the espresso but add hot fudge, kataifi and toasted pistachios. Wow- this is really good. At first I thought I liked the espresso better but then I had a bite with the toasted pistachio. It rocked my world I have to say. Both of these sundaes are excellent and are really a bang for the buck at only $4.95 a piece. That’s less than I spend at crappy Tasti-Dee-Lite. This is a great stop for sweets in the East Village.